﻿ Is Real Madrid up for the task in the Champions League? 21.02.2013 » Is Real Madrid up for the task in the Champions League? Now that we've seen all teams in action at the first legs of the last-16 round, it seems clear that several clubs can aspire to reach the Wembley final in May. Sixteen teams have clashed in the last 8 days and while some of them confirmed their favoritism, others flopped in the big stages. The second leg returns on March 5, with a thrilling Manchester United vs Real Madrid at Old Trafford, after that 1-1 draw in the Santiago Bernabéu last week. Margin for error has narrowed significantly at this stage of the UEFA Champions League and as we'll walk into the 2nd leg round next week, several teams will need to work hard in order to keep their hopes up in the competition. Juventus and Bayern Munich seem to have secured their spot at the next stage by now, as they both earned important away victories against Celtic and Arsenal respectively. 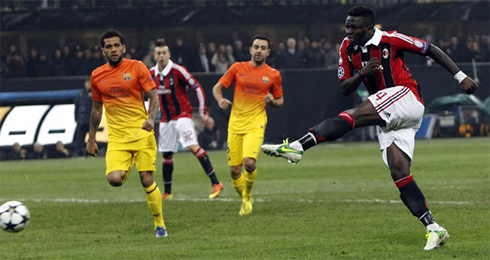 Barcelona surprisingly lost 2-0 in Milan this last Wednesday and they will need to be at their best in the Camp Nou, when the two sides meet again on March 12. As for the other 5 match-ups, every game ended with either a draw or a 1 goal lead advtange to one of the sides, which leaves a big question mark about who will move forward into the quarter-finals. We have exactly 16 teams still standing in the competition by now, some with better chances of moving forward than others, due to the first round of results from the last days. Juventus visited Glasgow to face Celtic and basically ran over the Scottish champions, with a 0-3 win that virtually seals the deal for the Italians. Matri, Marchisio and Vucinic scored for the "Bianoneri" and the second leg shouldn't hold any surprises for us, especially with a team as solid and regular as Juventus has been proving to be, over the past months. The other game played on February 12 was Valencia vs PSG, and it also ended with an away win for the French giants, with goals scored by Lavezzi and Pastore. The second leg should result in an interesting game, but for that to happen, Valencia really needs to score the opener in the first 45 minutes, otherwise Ernesto Valverde's side is most likely not going to have any chances of upsetting the French champions. PSG will certainly rely on their new Brazilian rising star, Lucas Moura, moreover now that Zlatan Ibrahimovic is ruled out for the 2nd leg game, after having seen a red card in Valencia. February 13 had two highly entertaining games announced, as Shakhtar Donetsk clashed with Borussia Dortmund, and Real Madrid hosted Manchester United at the Santiago Bernabéu. The first game produced 4 goals, as both sides tied 2-2 in Ukraine, leaving Borussia Dortmund with a slight advantage and favoritism to go through into the quarter finals. The Germans had already showed what they are capable of in the group stages and they are surely counting on reaching the later rounds this season, as rumors keep suggesting they might lose several key players next Summer, with the likes of Mario Gotze, Lewandowski and Reus in the front line. As for Real Madrid and Manchester United, a 1-1 draw leaves us with the prospect of a very open 2nd leg at Old Trafford and the promise of a lot more goals and dangerous attacking plays from both sides. Sir Alex Ferguson played his chips cautiously in a somehow defensive approach in Madrid and got rewarded with an always important away goal that might end up being crucial for this series final outcome. Real Madrid's only goal was scored by Cristiano Ronaldo from a brilliant header, in what will surely be a season highlight for the Portuguese superstar. The game at Old Trafford is definitely a candidate to labelled as the "Game of The Year". This last Tuesday, it was time for the Portuguese champions, F.C. 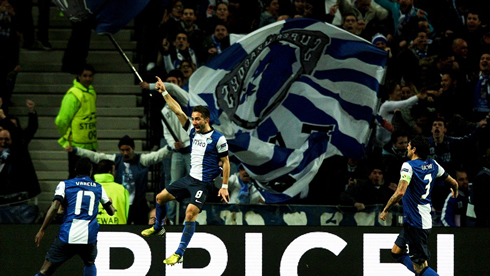 Porto and Malaga to step in and clash at the Dragon Stadium in Portugal. Vitor Pereira's men confirmed their favoritism and held Malaga in their own half for most of the game, but ended up only scoring one goal during the full 90 minutes, scored by one of the most talented midfielders in the World, João Moutinho. Malaga expects a totally diferent 2nd leg at "La Rosaleda" and were lucky to go home with a 1 goal disadvantage result, given the superiority shown by the Portuguese side. At the same time that game was played in Porto, Arsenal and Bayern Munich locked horns in Wembley, with the Germans proving they are certainly one of the favorites to lift the trophy this season. Bayern defeated the Gunners by 1-3, leaving Arsene Wenger in a very delicate position and Arsenal fans in complete frustration as their chances to pursue the European dream were almost vanished for good. The 2nd leg game shouldn't bring us any surprises and Bayern Munich are indeed one of the stronger teams of this Champions League edition. Wheter or not Real Madrid will get through Manchester United on March 5 is still highly uncertain, but even assuming the Merengues will be capable of coming on top at Old Trafford, the road ahead to the Wembley final will be far from easy. Right now, Juventus and Bayern Munich seem to be in the first row as the stronger candidates to win the Champions League, but their status and favoritism will obviously depend on the outcome of the Barcelona vs Milan and Manchester United vs Real Madrid games. Can Mourinho get the better of Sir Alex Ferguson at his own home ground? Will Cristiano Ronaldo be capable of leading Real Madrid to an historic win at Old Trafford? If these premises turn out to be true, than the Merengues can really fly high and have legit hopes of reaching the Wembley final this season. Cristiano Ronaldo next game for Real Madrid will be against Deportivo de la Coruña, on February 23, 2013. You can watch Juventus live stream, Deportivo de la Coruña vs Real Madrid, Liverpool vs Zenit, Chelsea vs Sparta Prague and Lyon vs Tottenham, all matches provided from our soccer live streaming section.